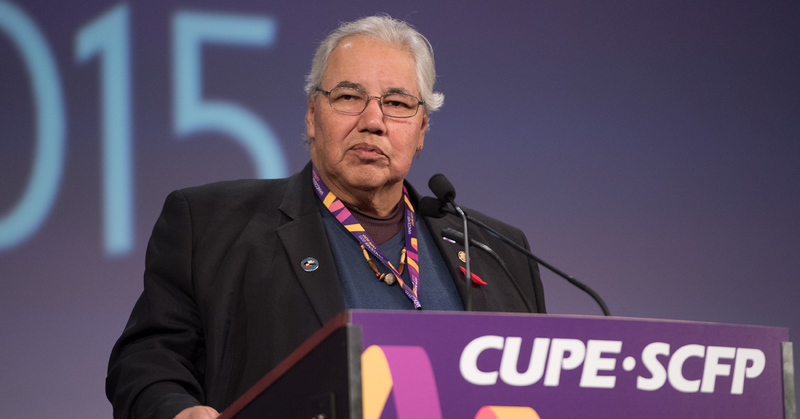 Justice Murray Sinclair, chair of the Truth and Reconciliation Commission, gave convention delegates an in-depth and emotional presentation on the history of Canada’s Indian Residential Schools system, and it’s devastating legacy for survivors, their families, Indigenous nations and Canada. Sinclair recounted Canada’s colonial history and the devastating effect it has had on Indigenous peoples. He highlighted the treaty relationship between Canada and First Nations, in particularly in relation to education. While First Nations saw education as a right when the treaties were first signed, the Canadian government at the time, and throughout history since, have seen education as a tool for assimilating First Nation children. “I could tell you in excruciating details of the stories of residential schools survivors they tell of the abuse they suffered. We can hear the stories, but we can never really understand,” said Sinclair, before introducing a video of a survivor’s testimony during the Truth and Reconciliation Commission. While a tragic and long chapter of Canadian history, Sinclair emphasised the need for reconciliation between First Nations and Canada. He told delegates the work will be long, and ultimately will be up to future generations to fully achieve.